When you root for your favorite team, it’s tough to see them lose on the big stage. Isn’t it? I feel the same way. But I also know that my disappointment is merely a function of my thinking. It happens when I THINK that I NEED my team to win…and when they don’t, there is a misalignment between my reality and what I think my existence SHOULD be. It’s this misalignment that creates a “down” mood…sadness, loss, frustration…etc. 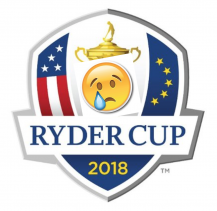 I could have just as quickly thought about the joy and delight that the Team Europe guys were experiencing…and cultivated much more productive feelings and mood. So, keep in mind that your mood today is a function of your thinking. And you can change your thinking if you want to. While watching the Ryder Cup this weekend, I was looking for signs of nervousness and anxiety. Signs that the pressure was having an impact on a player. It’s not always easy to see, but sometimes it shows up as stiffness that creates clunky or “steered” shots…and in putts that look rigid, tentative, or that miss their mark by a lot. It can even show up as poor decision-making. For those who watched a lot of the coverage, I’m sure that this was easy to see. One example that comes to mind for me is the Saturday afternoon match between Woods/DeChambeau and Molinari/Fleetwood. Molinari/Fleetwood won the match 5&4. And what I noticed a lot of with Tiger and Bryson was that neither of them hit very many shots that they are capable of. Said a little differently: they missed a lot of shots and putts that we might all agree are within their wheelhouse of capability. On the contrary, Molinari and Fleetwood seemed to be hitting great shots, again and again. Swinging and playing with a lot of freedom. It’s hard to know for sure, but it looked like both Tiger and Bryson were indeed feeling the pressure of the moment. And this feeling created more stiffness in their swings and putts – or LESS freedom and suppleness. It became tougher for them to hit fairways, hit greens in the correct spot ( or hit them at all) and even make the six-footers that they could usually make in their sleep. Now, their lots of variables, so it’s hard to make a blanket statement like I just did and guaranteed it’s accuracy. 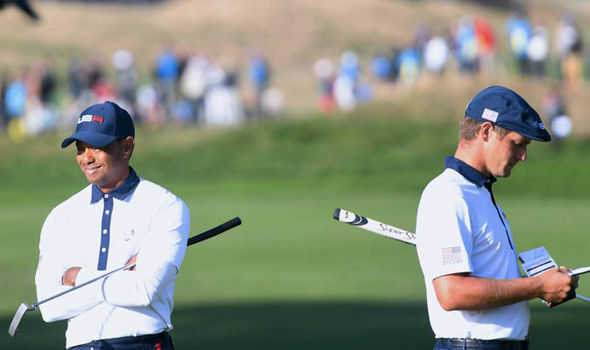 The course was relatively new to them, the team format may not have suited certain parts of their game, and their competitors (Molinari and Fleetwood) may have just had one of those rounds where they couldn’t miss. But it did seem to me that the pressure of the moment may have impacted them. So what to do when you are feeling pressure on the course? More than anything, find ways to prevent the distractions that create poor swing mechanics. For example, just stepping into a shot without THINKING A LOT about the ball is a proven way to keep distraction at bay. Pull the trigger (on your full shots and putts) as soon as you are ready. No lingering. No hovering. Step up and pull the trigger. It keeps your “procedural memory” …which is associated with muscle memory… in charge of your swing rather than turning it over to what is called “working memory”…and which is related to analysis and thinking. Another way to prevent from being impacted by pressure on the course is to focus positive intentions toward others. Focus positive thoughts on the people around you…your playing partner, your competitors…etc. Research has shown that it is impossible to be engaged in positive feelings about others AND be anxious or worried at the same time. It’s why I often talk about LOVING your competitor. It keeps you in a productive place and allows you to tap into your real potential in each moment. No matter the situation. No matter the stakes. Give these methods a try, and I think you will like how they work for you! Paul Monahan, PCC is a Peak-Performance coach, member of the International Coach Federation and a certified COR.E Performance Dynamics Specialist. He resides in Cleveland, Ohio with his wife Paula and is the proud dad to three young men. He can be reached here. Distance – How to Get More ….